Danfoss is bringing its UK Heating, Cooling and Drives divisions under one roof at a central location just 15 minutes drive from London Heathrow. The company’s existing facility at Denham has been completely remodelled and refurbished to create a brand new Customer Service Centre (CSC) and Technical Support Department serving the three business segments. Having a united team serving all UK customers marks another milestone on the company’s journey to becoming ‘One Danfoss’ in the UK and building a more collaborative and customer-centric organisation. Danfoss customers will be able to get in touch with the CSC and Technical Support teams at Denham using dedicated telephone, fax and email contacts. This will be complemented in due course with a new Service Cloud System, which will connect customers on one service platform for even faster enquiry handling and response times. 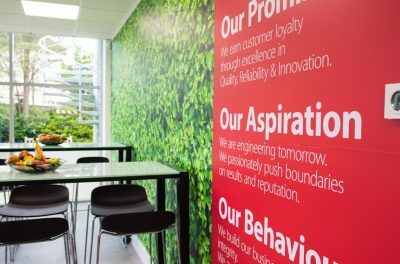 The Denham facility comprises three state of the art conference rooms, a new reception and catering break out area as well as an 80-inch touch screen, which will be used to showcase the latest Danfoss product developments. The largely open plan working areas are connected by an IT system that will allow staff to move around seamlessly with connectivity assured throughout the building. The Danfoss site in Bedford will continue to operate as the production facility for the company’s world-class electronic heating controls, including timers, programmers and electronic thermostatic radiator valves.